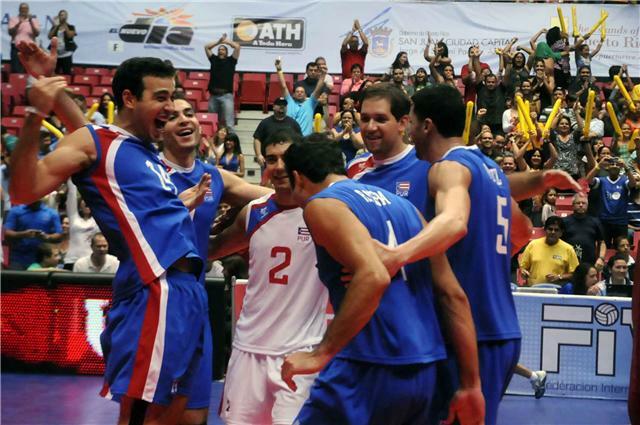 SAN JUAN, Puerto Rico, May 29, 2010 – Hosts Puerto Rico won the bronze medal of the Men’s Pan American Volleyball Cup after scoring a 3-1 (25-18, 25-17, 16-25, 25-17) victory over Brazil at Roberto Clemente Coliseum on Saturday. The home team relied on a balanced offence led by Victor Rivera who finished the night with 14 points. Enrique Escalante, Roberto Muñiz and Jose Rivera contributed 13, 12 and 11 tallies respectively in the winning effort. Mauricio Silva was the only Brazilian scoring in double digits with 13 points.